Home » bbc , doctor who , television » "Flatline": Chris declares this week's DOCTOR WHO to be nothing less than astounding and brilliant! "Flatline": Chris declares this week's DOCTOR WHO to be nothing less than astounding and brilliant! It's been 45 minutes since the transmission (heh-heh-heh, did you see what I did there, saying "transmission" like they always do in Britain? That's all I got...) on this side of the pond of "Flatline". And with each passing minute I'm coming to be convinced more and more that this episode of Doctor Who may be one of the very best since the legendary "Blink" of David Tennant's era. "Flatline" was classic old-school mystery/horror and along with the past few episodes I'm reminded a lot of the more terrifying stories from the Tom Baker years. This was no exception, and along that trend "Flatline" is the finest of the bunch. 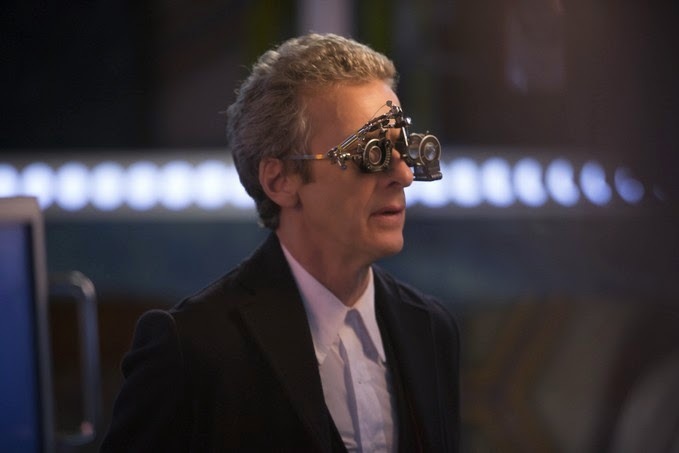 In fact, I would even go so far to say that this was the greatest episode of Peter Capaldi's run we've seen so far. There were some real "hiding behind the sofa" moments in this episode and I think it will be a solid entry on a lot of fans' "favorite Doctor Who stories" lists. It was also - it goes without saying - replete with plenty of humor (especially in regard to the teeny-tiny size that the TARDIS exterior begins to be). You can tell that Capaldi is really settling into his role as the Twelfth Doctor and that he's having a wazooload of fun with it. The chemistry between him and Jenna Coleman's Clara is a sincere delight to behold, and "Flatline" may be the best example yet of that. So what made "Flatline" so awesome? 1. The most terrific interaction we've seen yet between Clara and the Twelfth Doctor, despite the fact that they were rarely together (more or less). 2. Clara standing on her own two feet and showing what she's capable of when practically alone. 4. A cerebral concept that was brilliantly executed and was quite easy to follow along. 5. Secondary characters that viewers could readily empathize with. 6. The Boneless: perhaps the most original new monsters since the Weeping Angels arrived in "Blink" several years ago. And just as horrific. 7. The "I am the Doctor!" scene where the Doctor breaks bad and reminds us that no matter how afraid we may be of the monsters, the monsters will always be afraid of the Doctor. All in all, "Flatline" is an absolute hoot of an episode and I'll no doubt watch it again from my DVR before the weekend is out (maybe before tomorrow night's The Walking Dead). Something else that I've been meaning to mention. I am really digging the music that Murray Gold came up with for the Twelfth Doctor's theme. There is an epic majesty and sense of mystery to it that complements Capaldi's Doctor just as spot-on as "I Am The Doctor" was for Matt Smith's. Here's hoping that the BBC won't be long in putting out a Series 8/Season 30-something soundtrack. Then again, we're still waiting for that score from "The Day of the Doctor"/"The Time of the Doctor" from the fiftieth anniversary last year. What's the hold-up on that anyway?! ...somehow, that makes things seem a little brighter in the world. Agreed Chris. And Clara for once got to put herself in the Doctor's place and become him. She even got the sonic screwdriver and a companion of her own. The Doctor was giving guidance but that went so far and when the chips were down Clara proved she was a genius all her own. Loved this episode!